I wrote about the receipt of my 18-months lump sum as part of my SSS retirement benefit in July 2013 after waiting for 7 months from the date I filed my application. The lump sum payment was retroactive November 2012 so I begin to receive my monthly SSS pension only in May, 2014. I got to withdraw it together with my 13th month bonus for 2013 in May 19, 2014. I have no complaint so far in the payment of my monthly SSS pension until I noticed something wrong with the time lapsed between the day it was credited to my bank account until the actual day it becomes available for withdrawal. Right after opening the bank account for my SSS pension in January 2013, I registered it with the bank’s online banking services so I can monitor its status. I posted herewith an image (click to see a larger version) of my account’s last ten transactions so we can better understand my complaint about the number of days that I have to wait from the day my pension is credited to my account to the day I can withdraw it. In banking parlance, the issue I am writing about here is called “float“. This is just a small matter if we consider only the amount of my monthly pension; however, if all authorized banks are floating the SSS pensions the way my bank does than we are not taking here about petty cash. In cheque clearing, banks refer to bank float and customer float. Bank float is the time it takes to clear the item from the time it was deposited to the time the funds were credited to the depositing bank. Customer float is defined as the span from the time of the deposit to the time the funds are released for use by the depositor. The difference between the bank float and the customer float is called negative float. Negative float is used by the bank as the overnight investable funds. July 2, 2014 – My monthly pension was credited to my account on this day so this is Day One in its float period. If SSS issued an Other Bank’s check as payment to the pensioners’ account in my bank, the Bank Float should take 3 banking days before I can withdraw my money. 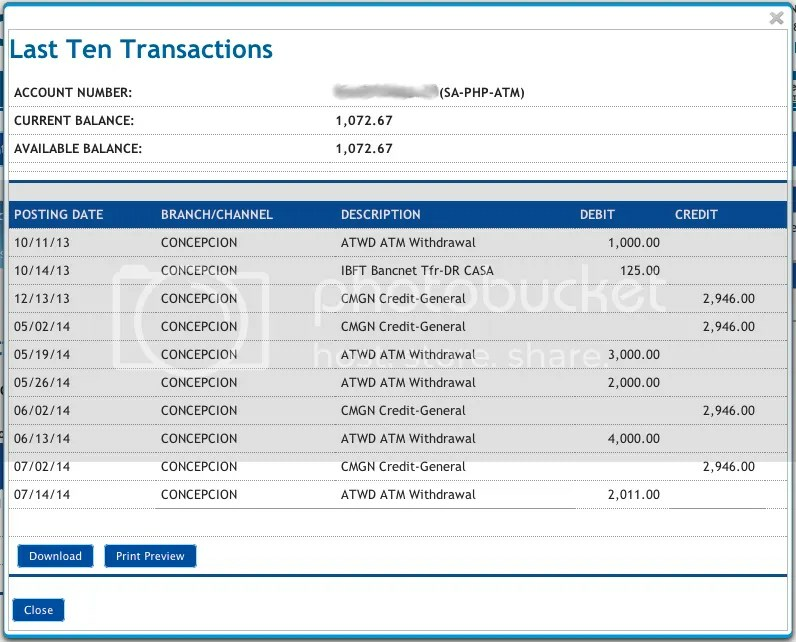 However, in July 5, a Saturday, I checked my account online and my SSS pension was not yet available for withdrawal. July 6 to 12, 2014 – I checked the status of my account twice each day (first time in the morning after the start of banking hours and another time at around 6:00 PM) but my pension did not appear as available or withdrawable. July 13, 2014 – This is the day my SSS pension for the month of July became available for withdrawal. I knew it when I checked my account online in the evening of this day. I made a withdrawal the next day, July 14, 2014. Basing on the above events, I consider that the SSS pension payments floated in my bank for at least 10 days. Further, the 10 days (also the negative float) were all due to consumer float because I did not give any allowance for the bank float. The banks collect SSS contributions of active members so the money for the payment of a retired member’s pension is already there right on the day it was credited. You might think that it is really just small money that I am raising an issue over here. But, consider this . . . Currently, SSS has 1.8M pensioners who receive an average of PH₱3,100 monthly according to a news release. If my calculator does not fail, SSS pays a total of PH₱5,580,000,000 every month to its pensioners. At 3.5% overnight lending rate, you may do your own calculations and know why our banks are making so much profits. Hi there would you mind sharing which blog platform you’re working with? I’m looking to start my own blog iin the near future but I’m having a difficult time choosing between BlogEngine, WordPress, B2evolution and Drupal. The reason I ask is because your design seems different than most blogs and I’m looking for something unique. P.S Sorry for getting off-topic but I had to ask! Your way of telling everything in this piece of writing is really pleasant, all will be able to simply be aware of it, Thanks a lot.